Practical karate. It’s a contradiction in terms, right? Karate is for dojos and kids birthday parties, not the cage. 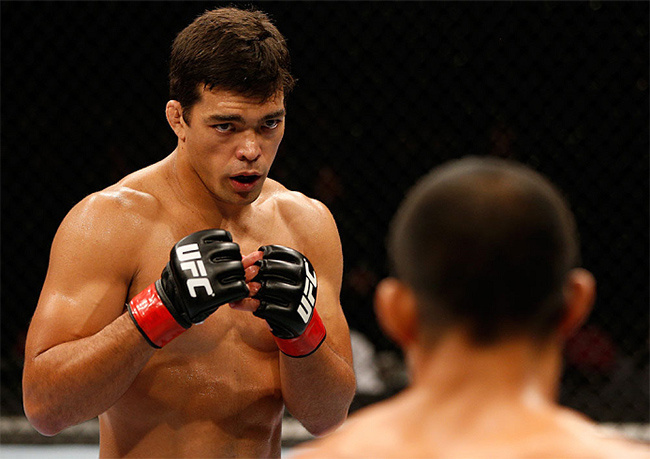 Yet time after time UFC middleweight (and former light heavyweight champion) Lyoto Machida stumps or starches his opponents with techniques that in other combat sports are considered simple or just plain wrong. It's treu that speed, power, combinations, and counter techniques are part of what makes Machida great, but what he really excels at is his use of elements that are harder to identify but if anything deserve more appreciation. Timing, movement, and feinting are the pillars of Machida’s minimalistic but effective game. And he used all three last week in his quick head-kick victory over Mark Munoz. Read on and I shall relate some of the masterstrokes Machida applies in his performances. Angles are the key to landing successful blows while remaining relatively safe. It's the same in one-on-one combat as it is in large-scale warfare: Getting to the side of an opponent, or better yet behind him, almost invariably assures a successful attack. Picture yourself in a Lord of the Flies-type scenario and visualize yourself competing with a stronger man for food or shelter, or the bottle caps that will be used as currency after the bomb drops. If you don’t have the idea “I’ll just sneak up behind him and bash his head in with a rock” sopmewhere in your mind, you are in the minority. Or worse, you’re the guy who is getting brained. Whether you are conscious of it or not, you as an animal know how important it is to get a dominant angle on someone--somewhere from which you can hit him and he can’t hit you, a position where he must turn to face you before he can hope to fight back, and from which he’ll struggle to see your blows coming. The problem is that as soon as a fight stops being about life and death, and becomes a good old-fashioned sport, most people lose grasp of how important the dominant angle remains. Everyone who has watched a little boxing or kickboxing should be familiar with the basic southpaw angle. When one fighter is in an orthodox stance and the other is in a southpaw stance, both fighters will work to get their lead foot outside of their opponents. This will place their rear shoulder on a line between the opponent’s shoulders, which guarantees the shortest path for their rear hand. It also takes the fighter’s head away from the opponent’s power hand. 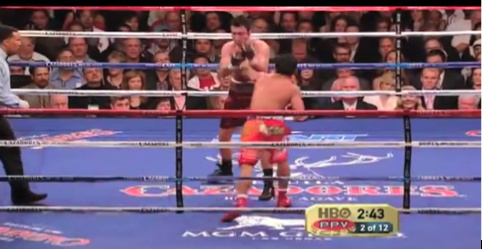 Notice here how boxer Manny Pacquiao has placed his lead foot outside of Oscar De La Hoya’s. This takes Pacquiao’s head away from De La Hoya’s right hand while shortening the path Pacquiao’s left hand has to travel. The tendency with simple principles is that they become a battle of strength and will. Both men can clumsily batter each other while trying to get their foot outside of the other man’s lead. What Lyoto Machida does is add a touch of finesse through his use of distance, feinting, and movement. 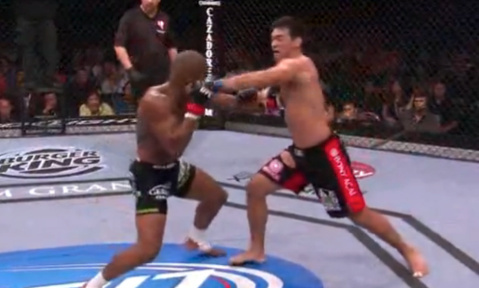 Notice how Machida’s boxing form is pretty poor, his chin up in the air. But because of Machida’s dominant angle (his right foot outside his opponent’s left), Sam Hoger has to punch across himself to land. 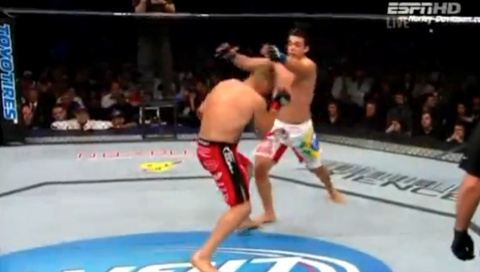 As a result, his punch is awkward and lacks the power and speed of Machida’s from this position. By fighting at a greater distance than most strikers, Machida forces his opponent to take a step before attacking. Fighters work hard to avoid telegraphing their techniques so they can throw them right out of their stance without warning. By increasing the range between himself and his opponent, Machida forces his opponents to take closing steps, which means he has more time to react to attacks and is not forced to react to small feints as much as he would be at closer range. And since opponents must really commit if they hope to catch Machida, they open up defensively, becoming much easier to counter. Machida can then react to their step, choosing to retreat or lunge in with a counterattack. When he can successfully bait an opponent into chasing or trying to step and then throw a technique, Machida can easily step outside of the anticipated destination of the opponent’s foot and land his left straight. The act of stepping in as the opponent does creates not only a more powerful collision than trying to hit an opponent on the retreat, but it also makes Machida seem insanely fast in closing the distance, when his opponent is in fact doing half the work for him. Here Machida maintains the distance against Rashad Evans. 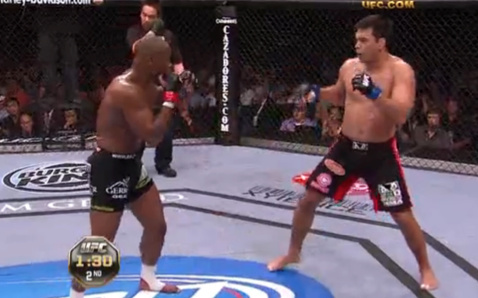 As soon as Evans steps in, Machida steps in to meet him. This causes a collision and makes Machida appear far faster and more powerful than he would be if he were chasing or striking at a stationary target. Another instance of Machida using an angle, this time on offense, is when he hops to a minor angle before flurrying. Machida used this superbly against Thiago Silva and Quinton Jackson. By moving to his left, Machida forces the opponent to pivot and face him. In the instant that a fighter is turning, even a powerful puncher like Silva or Jackson has no real power in his strikes because he is pivoting on one point. By rushing in with his left straight and follow up punches as they are pivoting, Machida can effectively get a free shot in on his opponent. Thiago Silva approaches Machida, having to move through that buffer zone of space that Machida always uses. As Silva turns to face Machida, Machida is free to leap in with strikes, knowing that Silva cannot hit back with authority until he has re-established his stance. A final instance of Machida using angles to create opportunities to strike is his exploitation of what, in karate, is called the “blind angle.” This is the point directly in front of the opponent where he cannot see the floor. Anything that travels through this angle without much telegraphing stands a good chance of catching an opponent out. Although in the traditional boxing arsenal the uppercut is the only strike that comes from below (save Evander Holyfield’s head butts), boxers can, by holding their hands lower, throw a straight punch that follows an upward arc, a trajectory that is hard to detect. Gene Tunney and Muhammad Ali are great examples of fighters who carried their hands low for offensive purposes. Lyoto Machida may not often use straight punches on offense, but when he does, they come from a low angle, which can often throw better boxers off their game. The blind angle is the area below a fighter’s vision. Through this angle techniques can often be thrown undetected. Machida uses the front kick in many of his bouts, both to the body and the jaw, but perhaps the most famous instance was against Randy Couture. On that occasion Lyoto performed a fake with his rear leg before leaping in with a kick through the blind angle with his lead leg. Lead leg kicks tend to lack power without a switch of the hips first, but eliminating this switch also means the kick is harder to detect. This leads us to the subject of feinting. One of the most important aspects of Machida’s game, and one that allows him to save a great deal of energy, is his excellent feinting. Feinting is an extremely hard art to master and is increasingly underappreciated in combat sports. A great feint must be similar enough to the actual motion of the strike that the opponent can be fooled but reserved enough that the feinting fighter remains on balance and in position to throw any manner of strike when the opponent does react. To this end, feinting with the hands or legs rather than the hips or shoulders is not all that useful. While an opponent is likely to react if he sees just an arm extending at him in the motion of a punch, the feinting fighter will have far fewer options with which to capitalize on the opponent’s reaction. There are two main feints Machida uses to incredible effect. The first is his feint of the left kick. Machida’s snapping left kick has caught many good fighters clean, but for every kick he lands, there are almost three times as many occasions where he feints it. This feint is perfect, too, in that it is not simply a softly thrown technique but a movement that is almost identical to the initiation of the kick, with none of the commitment. Lyoto draws his rear foot slightly underneath his body, gets onto the ball of his foot, and pushes his hips towards the opponent. 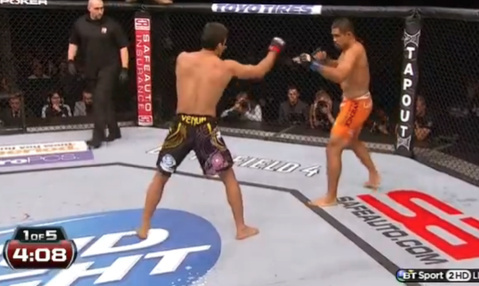 Here Machida stands in his usual stance, a good distance from Mark Munoz. Machida gets on to the ball of his back foot, drawing it in and pushing his hip toward Munoz. Machida has feinted enough of the kicking motion to force a reaction but remains able to attack, counter, or defend as needed. 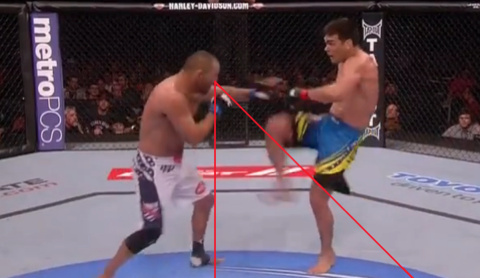 At all points in the movement Machida is free to run or attack. Machida’s opponents get so caught up in the frequency of this feint that they are either dulled to the motion or are so distracted by identifying his intentions with each leg movement that a simple 1-2 combination or right kick will throw them off completely. The second great feint that Machida uses is more of a fake than a feint. Where a feinted technique is only slight, a fake technique is one that is completed but with no intention of connecting. When in open guard (that is, southpaw vs. orthodox or vice versa) Machida will use his lead hand to slap down his opponent’s lead and jump in with his rear hand straight. This is standard southpaw practice. This basically means that when Machida wants to land his rear hand straight both of his hands are extended. He uses this position to beautifully disguise his sickening left knee strike. As Machida extends his arms toward the opponent, they assume the left straight is coming and duck directly into the oncoming knee. 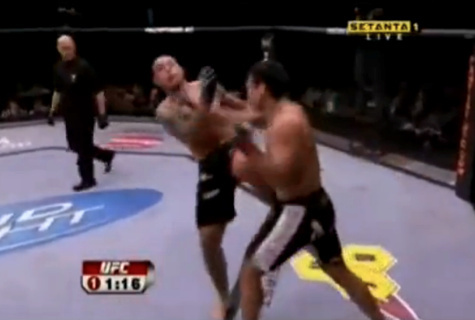 Lyoto very obviously throws his arms out simply to get Couture ducking into his left knee strike. Machida has done this to everyone from brawlers like Mauricio Rua, Thiago Silva, and Rampage Jackson to wrestlers like Tito Ortiz, Randy Couture, and Dan Henderson. Lyoto Machida has, on the face of it, a pretty bare-bones game. He throws rear straights from either stance as a counter, he uses a counter knee strike exceptionally well, and he has some good kicks. “Kata is what happens between the movements” is the oft-quoted phrase in karate circles, refering to the discipline's choreograophed patterns of movement. In Machida’s case, karate is what happens between the movements. It's not that Machida’s left straights or knee strikes are magical. It's not that he has practiced the fundamental movement so many times that he can go right through his opponent’s defense with ease. It's that Machida’s movement, feinting, and timing assure that when he does move, his opponent’s defense is never there.